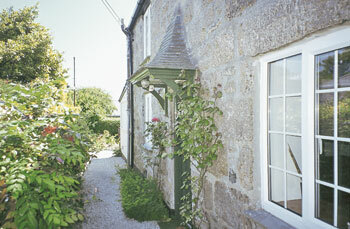 Chy Vean is a two bedroom detached cottage dating from the 19th century. It retains many original features such as beamed ceilings and has a south facing garden. 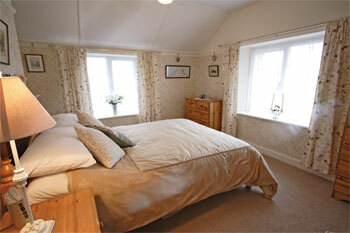 It is set in the heart of the picturesque village of Madron, which overlooks Mounts Bay. Just 2 miles from Penzance, the village shop, pub, church and children's playing field are close by and Trengwainton Gardens N. T. are a 10 minute walk. A comfortable and quiet base for exploring west Cornwall, walkers will enjoy the coastal footpath. Sandy beaches at Sennen, Porthcurno, Minack (with open air theatre) and St Ives. Visitors can enjoy day trips to the Isles of Scilly by air or sea. Two bedrooms. Sitting room and dining room both with beamed ceiling. Fitted kitchen with electric cooker and Rayburn. Bathroom/W.C. (electric shower over bath). First floor: Double bedroom with view of St Michaels Mount. Twin bedded room.